Make these Grilled Beef Franks with Peppers & Onions at your next cookout! 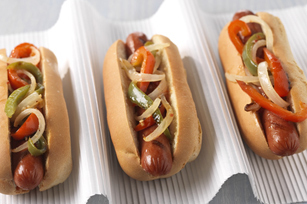 Fire up these franks on the grill, and have a tasty dish in no time! Place peppers and onions in center of large sheet of heavy-duty foil; drizzle with dressing. Fold to make packet. Grill 15 min. or until vegetables are crisp-tender, adding franks to the grill after 6 min. and cooking until franks are heated through, turning packet and franks occasionally. Cut slits in foil to release steam before carefully opening packet. Place franks in buns; top with vegetable mixture. Serve these flavorful franks with a smart side, such as fruit, or celery and carrot sticks. Prepare using your favorite mix of colored bell peppers.